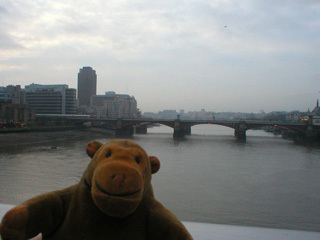 "You usually get a better view from here"
Mr Monkey left Soho and took the underground to St Paul's. 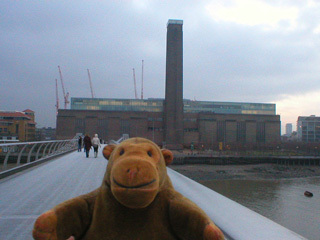 He scampered down to the river and ran across the Millennium Bridge, to get to the Tate Modern. Halfway across, he noticed it was very misty on the river, and stopped to check that the Blackfriars bridges were still there. Luckily for the people using Blackfriars station, they were.